Stellat’en Main Office is located just west of Fraser Lake BC and about 157 km west of Prince George (approx 2 hour drive by car). 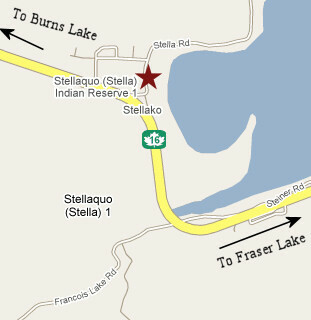 Stella Road is accessed off of Highway 16 and the main office is within a kilometre of the main highway. See the map at right for the relative location and you can click on the map for more detailed directions from Google Maps. For Contact Information or to Contact the Band Office, click here. 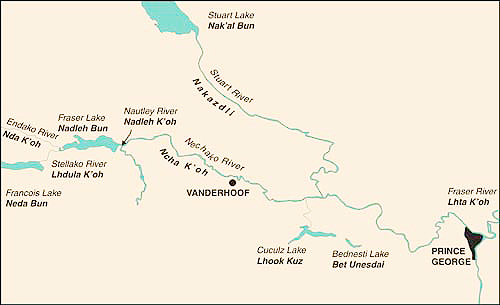 The Stellat’en First Nation has several sacred areas or locations within our traditional lands. These locations have been used by generations by our ancesters. A map depicting the Grandfather’s Trail is shown below.